PLEASE RETURN TO PAGE ONE FOR DETAILED INFORMATION ON ENTERING VIA TOES . From North of Denver, Go South on I-25 to hwy 7 East exit 229. Turn left onto Baseline Rd, go 0.3 miles and bear right to continue East on hwy 7. Go 8.3 miles to hwy 85 South, turn right. Go 4.7 miles South on Highway 85. Turn right (West) on Henderson (124th). From North East of Denver, Go West on I-76 to hwy 51 North exit 17. Turn right (North) on Sable Blvd. Go 0.5 miles and turn left (West) on East 124th Avenue. Go 2.5 miles and continue west on Henderson (124th) across hwy 85. From East of Denver, Go West on I-70 to I-270 West exit 279. Go West 36 4.0 miles to I-76 East. Go East 1.7 miles to hwy 85 North exit 12. Go 3.2 miles North, turn left (West) on Henderson (124th). From South of Denver, Go North on I-25 to I-76 East exit 216A. Go East 6.6 miles, merge left onto 85 North (exit 12). Go 3.5 miles. Turn left (West) on Henderson (124th). From West of Denver, Go East on I-70 , merge left onto I-76 East. Go 12.5 miles , merge left onto 85 North (exit 12). Go 3.5 miles. Turn left (West) on Henderson (124th). Go West 0.6 miles to the stop sign at Brighton Blvd. Continue West on Henderson (124th) past the stop sign; the fairgrounds are 0.6 miles ahead on the right hand side. The show hall is the exhibition building on the left. From the Show Hotels: LaQuinta Inn & Suites: Enter I-70 West from Havana Street. Go West 1.5 miles on I-70 and merge right on to I-270 West. Go West on I-270/Highway 36 4.0 miles and bear right to get onto I-76 East. Go East 1.7 miles to Highway 85 North exit 12. Go 3.2 miles North on Highway 85 to the stoplight at Henderson (124th). Turn left (West) on Henderson, go West 0.6 miles to the stop sign at Brighton Blvd. Continue West on Henderson (126th) through the stop sign, the fairgrounds are 0.6 miles ahead on the right hand side. The show hall is the exhibition building on the left. other fun activities throughout the show! not put anything on the walls. Please avoid noisy sales techniques that could disturb judging. is granted by the Show Manager. ENTRY REQUIREMENTS/FEES: An official entry form or facsimile must be used for each entry and submitted with a completed summary sheet & full payment in US funds. USPS, fax, and online entries will be accepted and are considered binding whether entry is benched or not. Online entries will be officially entered when payment is received, which should be no more than 5 working days of submittal. Cats will not be benched unless fees are paid. No post-dated checks will be accepted. Late payments at the door will incur a $20 charge. Returned checks will be assessed a $25 charge plus the original amount of the check. Ring Clerks will earn a free two day entry and lunches. Kittens or cats may NOT be confined to carriers, either displayed or under the bench, during show hours. HEALTH RULES: This is a non-vetted show. All cats MUST be fully immunized and tested negative for Feline Leukemia. All entries MUST be free of any communicable disease including, but not restricted to, fungus, fleas, and ear mites. Exhibitors who have Cats suspected to be ill or pregnant (as determined by the Show Committee) will be asked to leave the show hall with ALL their entries with NO refunds being made. LIABILITY: All participants agree to indemnify and hold Econo Cat Club, TICA, and the Adams County Fairground harmless from injury, loss or damage to cats, exhibitors, or property of exhibitors or vendors, or other such persons in attendance. 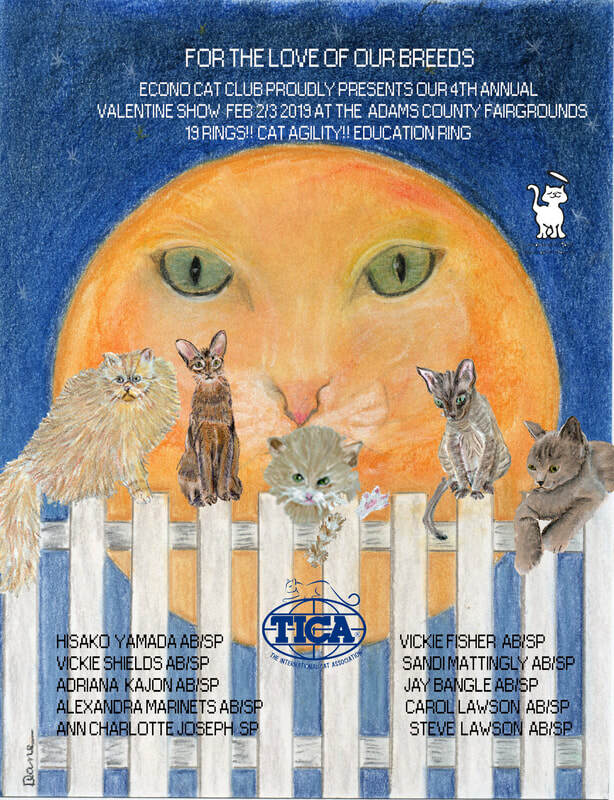 Per TICA Show Rules - Article 10 - Responsibilities of Exhibitors (210.3): Exhibitors shall not sit (or stand) in the ring area holding cats prior to or during judging except with the explicit permission of the Judge; these rules will be STRICTLY ENFORCED.